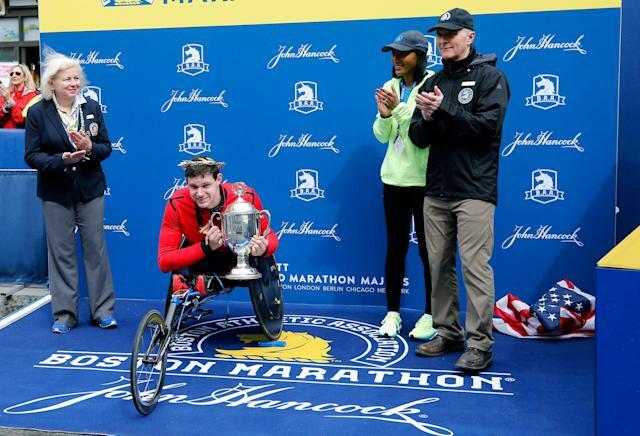 The Boston Athletic Association issued an apology after the American flag ended up scrunched up on the floor during the medal ceremony that followed the men’s wheelchair race at Monday’s Boston Marathon. “The Boston Athletic Association apologizes sincerely for the nature in which our Men’s Wheelchair Award Ceremony was held. We are reviewing our awards protocol to ensure that this does not happen again,” a statement from BAA chief operating officer Jack Fleming reads. The BAA hosts the marathon each year. Romanchuk, a student at the University of Illinois, became the youngest winner ever in the men’s wheelchair division of the race. He also was the first American man to win the Boston Marathon since 1993. He finished in a time of 1:21:36.